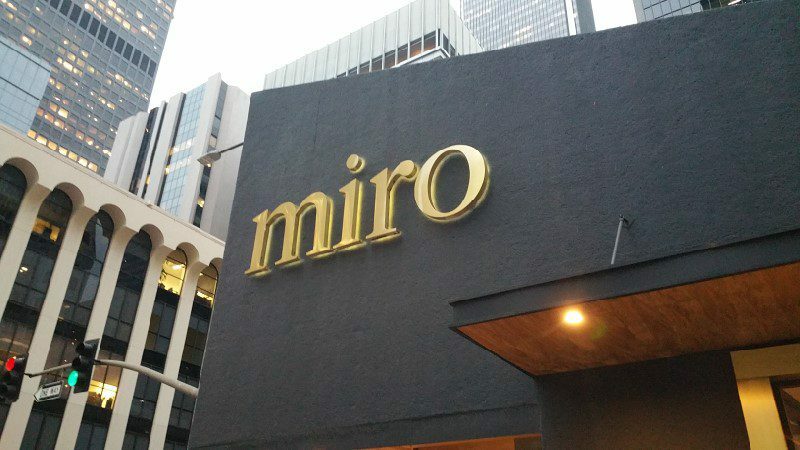 Miro Restaurant on the corner of Figueroa and Wilshire in the Downtown Los Angeles Financial District may look like just another new modern restaurant in town but there is more than meets the eye. From the street, the restaurant is dwarfed by the surrounding skyscrapers, especially the under-construction 73-story Wilshire Grand Center, which will be the tallest building west of the Mississippi. But, enter through the dramatic wooden doors where three different experiences await you. On the ground floor is the brightly light dining room. With floor to ceiling windows that face out to both Wilshire and Figueroa, the space is illuminated by the sun during the day. As you enter, you will be met by an elongated marble bar that is home to a pasta station, a charcuterie station and the bar which focuses on classic cocktails. The decor is modern with art deco touches. Chef Gavin Mills has prepared a menu that is pan-Mediterranean, meaning it is influenced by Italian, Spanish, Greek and North African cuisine. The focus is on hyper-local seasonal ingredients with Mills purchasing ingredients from multiple weekly farmers’ markets. Mills prepares all of the charcuterie in house and a board of charcuterie and cheese is a great way to start your meal. Our board had duck prosciutto, ungherese (Hungarian salami, paprika, garlic and white wine), cacciatorini (dry salami with black pepper), Drunken Goat cheese from Spain, Mont Vully Rouge from Switzerland and Smoke Blue from Oregon. 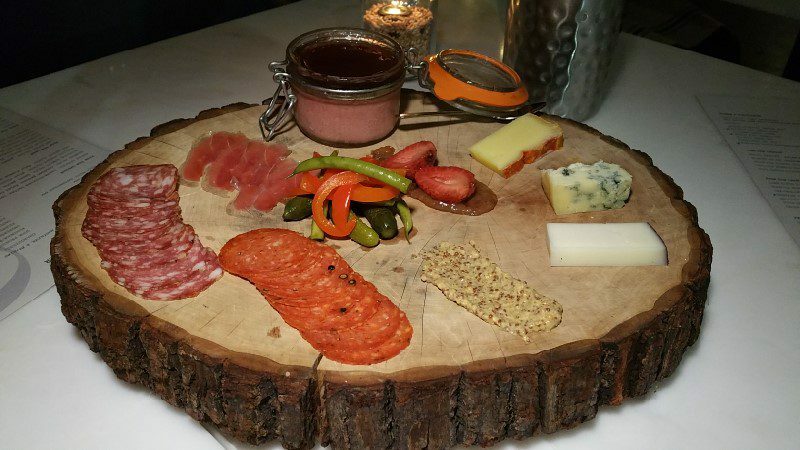 Presented on a magnificent slice of a tree trunk, the board also comes with house-made mustard, mostarda and pickles. Our board also included the chicken liver mousse topped with port jelly. The menu is divided into sections: From the Ground, From the Land, From the Sea, Pasta and Wood Fired Pizza. We started with two dishes from the Sea. 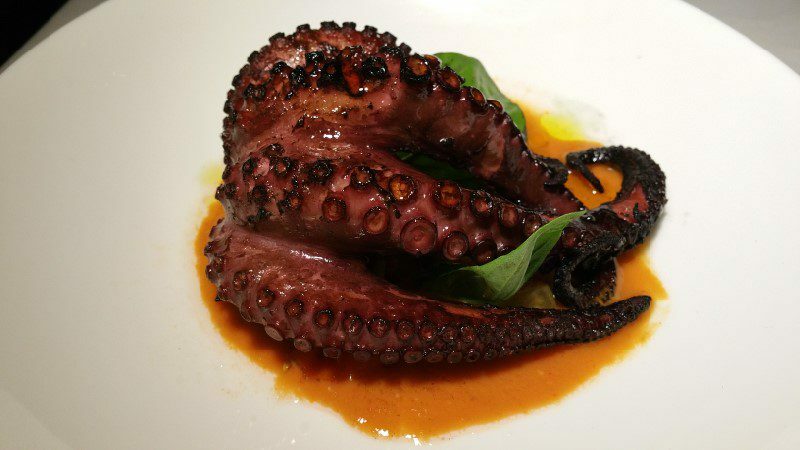 The Wood-Grilled Octopus with gazpacho, basil and pickled tomatillos was a full-sized half of an octopus. Perfectly cooked to tender, this was one of the favorite dishes of the night. 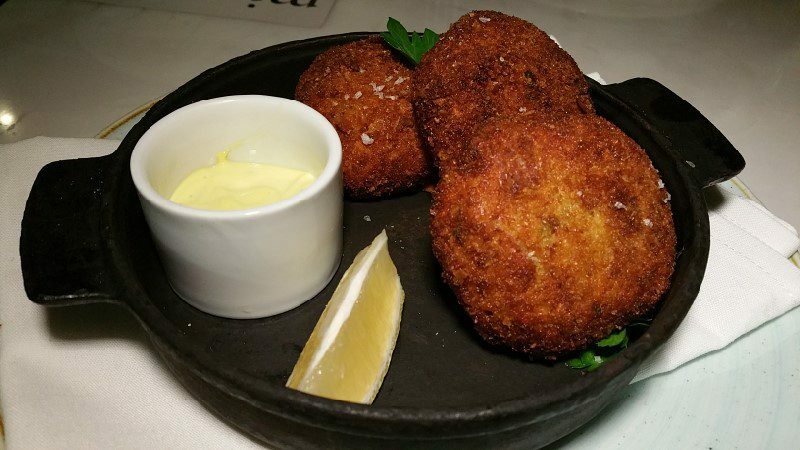 The Bacalao Croquetas are made with bacalao and potato and are served on top of piri piri with roasted garlic aioli on the side. The croquetas are soft inside with a crispy outer layer and are quite mild in flavor but the piri piri adds a lot of spice. 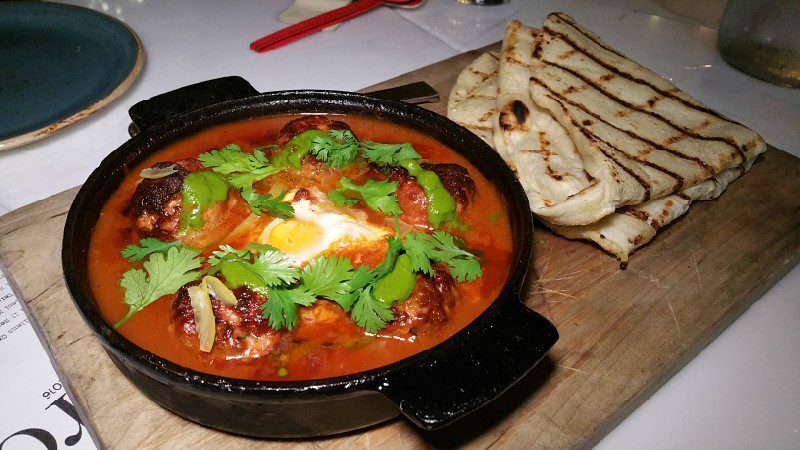 From the land section, the Lamb Kofta Tagine are tender lamb meatballs served with green harissa, preserved lemon and a cage free egg. The most delicious thinly grilled bread is served on the side. 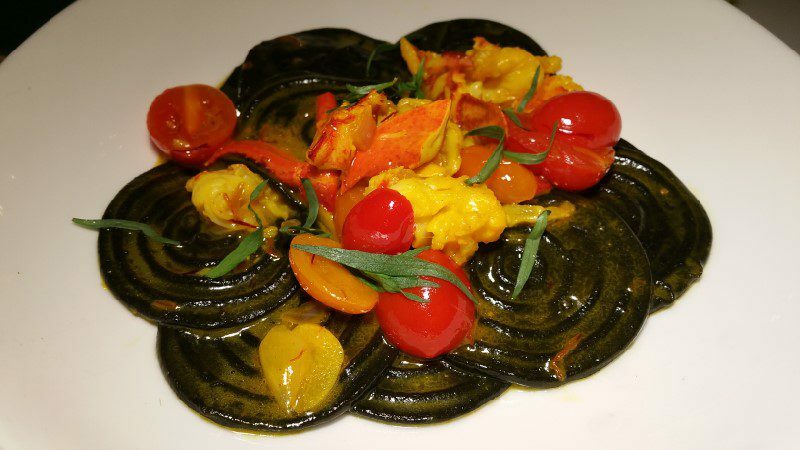 From the pasta section, do not miss the delicate and flavorful Squid Ink Corzetti with lobster, saffron and cherry tomato. Handmade daily, the corzetti are disc shaped with a circular detail on the top. 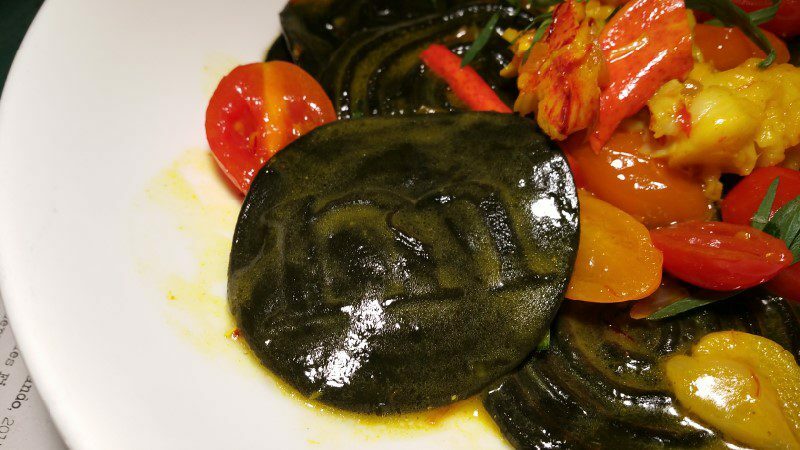 Turn the pasta over and you will see each one is stamped with a M, for Miro. 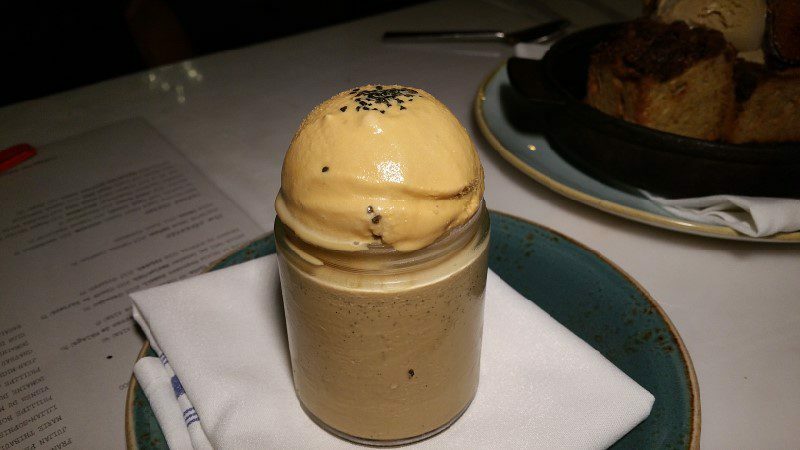 For dessert, we finished with the relatively light Butterscotch Pot de Creme with salted caramel ice cream. 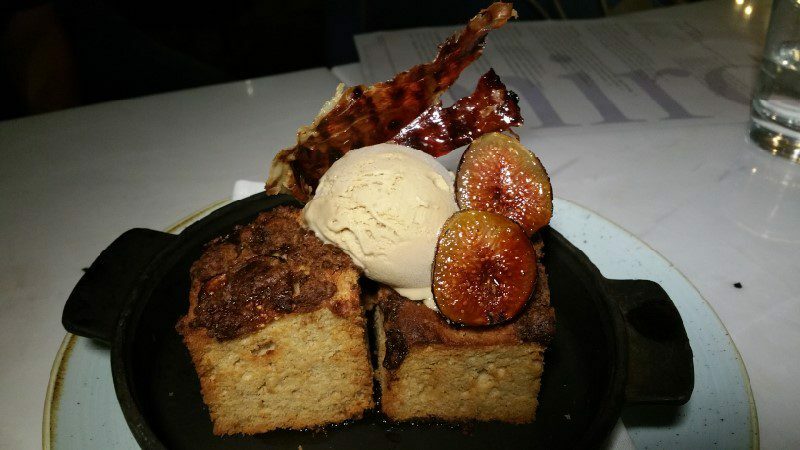 But the Warm Fig and Prosciutto Coffee Cake with bacon fat caramel, brulee figs and candied prosciutto leather also tempted us. I would love take an order of the candied prosciutto leather to go! 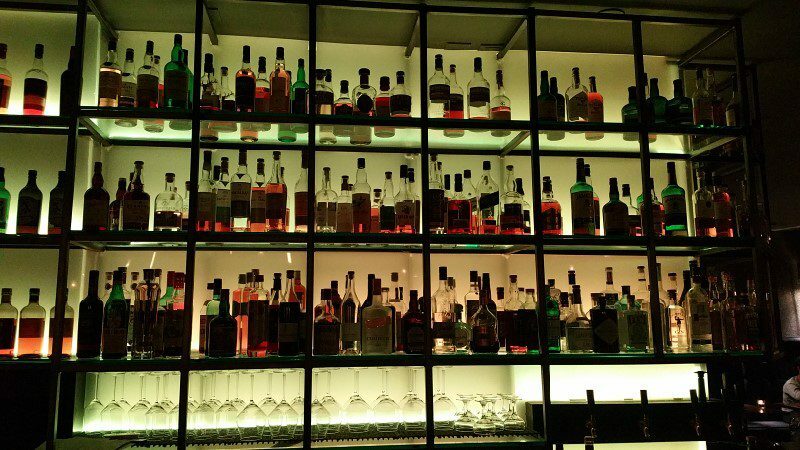 After dinner, or perhaps before dinner, head downstairs to The Basement Bar. While all of the buildings outside are jutting up into the sky, Miro heads underground. Two stories down a stonewall stairway, you will enter a dark lounge that is lit up by the back bar, which can change colors depending on the mood of the evening. 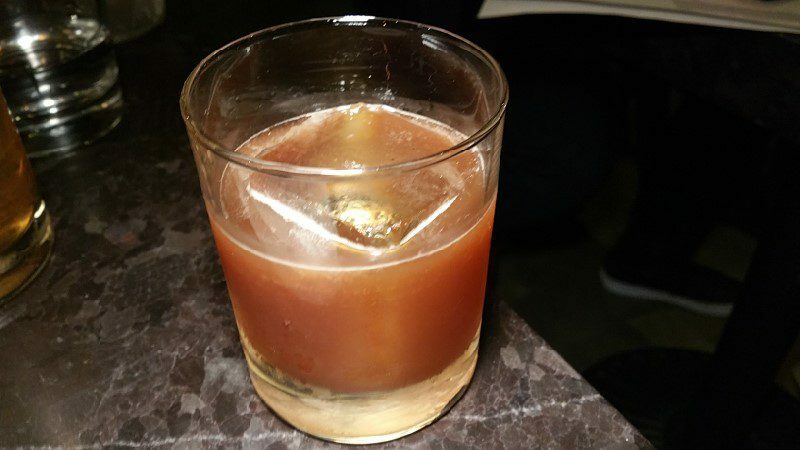 The Basement Bar offers a menu specializing in classic cocktails but is also home to more than 500 different expressions of whiskey. 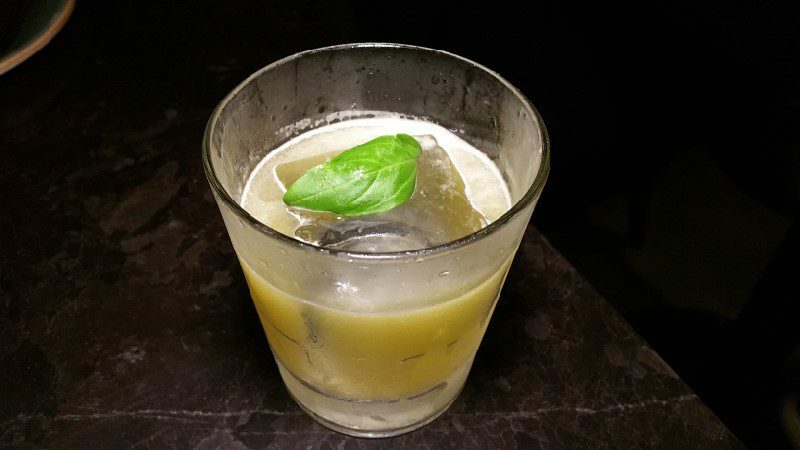 The bar team has created drinks that are synergistic with the restaurant upstairs, influenced by ingredients and flavors from France, Spain, Italy and the Middle East. 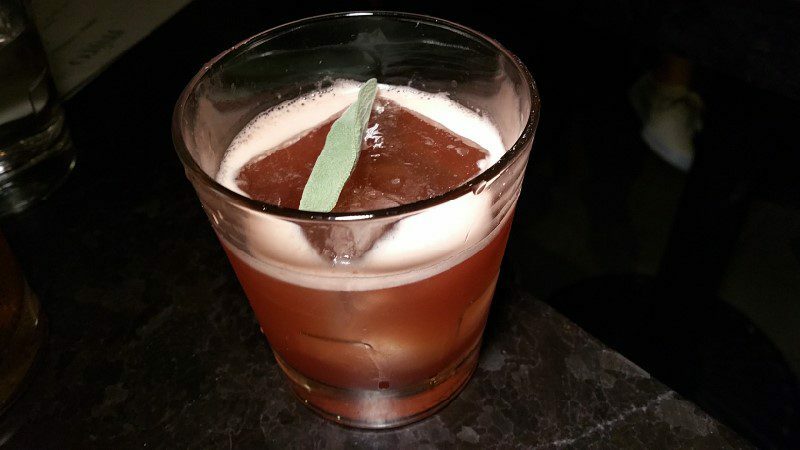 The Sonny Corleone is made with Isle of Skye 8 yr. scotch, Amaro Nonino, lemon, orange, honey and basil. 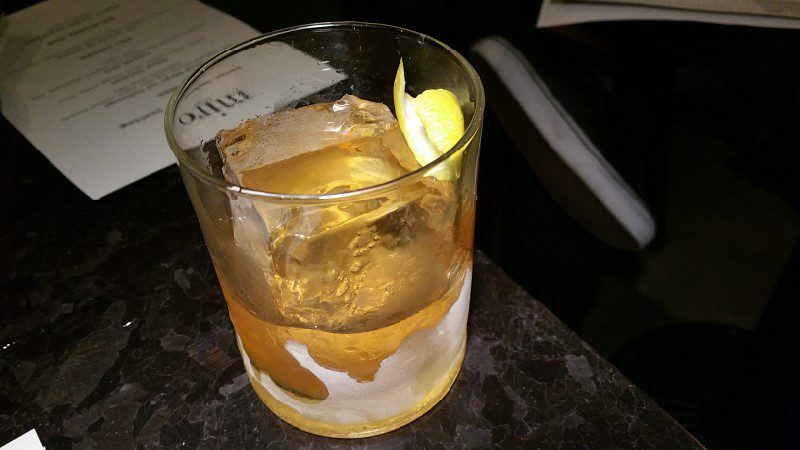 The Little Tokyo Old Fashioned is made with Toki Japanese whisky, rye, palm sugar made from dates, Giffard banana, Angostura and lemon peel. The Painted Bird is based on the Jungle Bird tiki drink and is made with guajillo infused blackstrap rum, Campari, pineapple, lime and palm sugar. Sweet on the nose and rich and honeyed on the palate, the bitterness of the Campari peaks through on the finish. Focusing on apples for the fall season, they were showcased in the Not Without My Bitters made with Clear Creek bourbon, American apple brandy, lemon, honey and 1/4 oz Angostura. 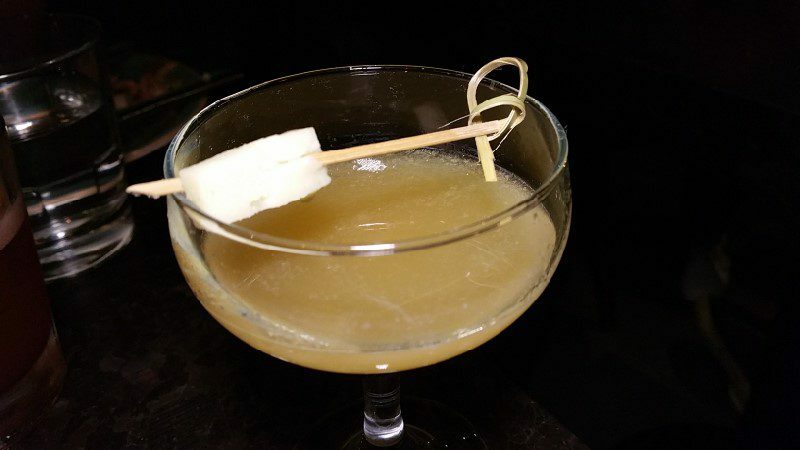 The sage leaf on top is aromatic and, on the palate, the drink is tart and bitter with a hint of sweetness from the honey. The final drink, which has yet to have a name, showcased a sweeter side of apples. It is made with Lairds apple brandy, lemon juice and a maple syrup/vanilla liqueur. The sweetness of the drink was balanced by the salty Spanish Iraty cheese garnish. Tucked inside the Basement Bar is the intimate Whiskey Room. 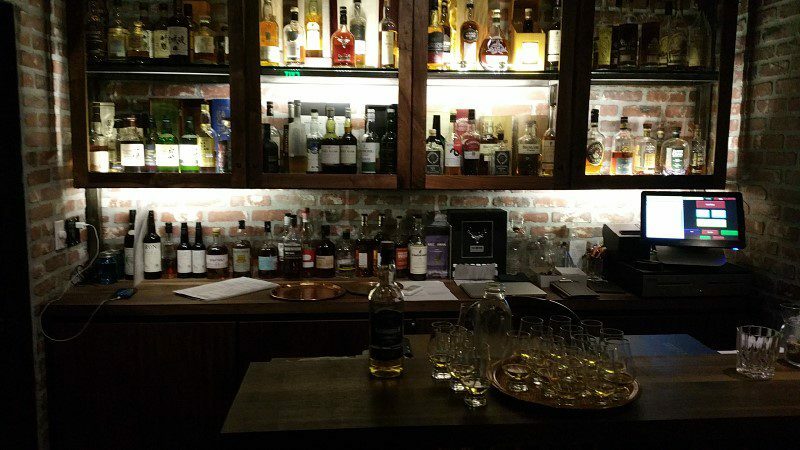 Located in a former wine storage area, the Whiskey Room has capacity for 15-20 people and offers unique and rare whiskies from around the world. 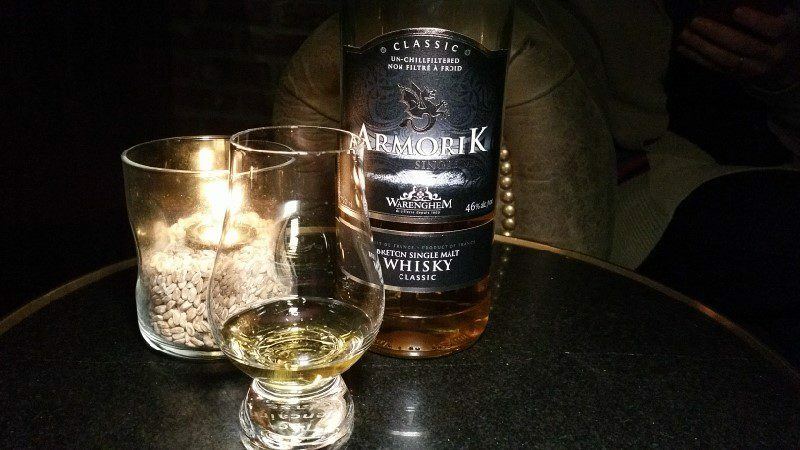 With jazz music playing in the background in The Whiskey Room, you will have the bartenders undivided attention as you enjoy a 1/2 oz. pour, a 2 oz. pour or buy a bottle and store what you do not finish. 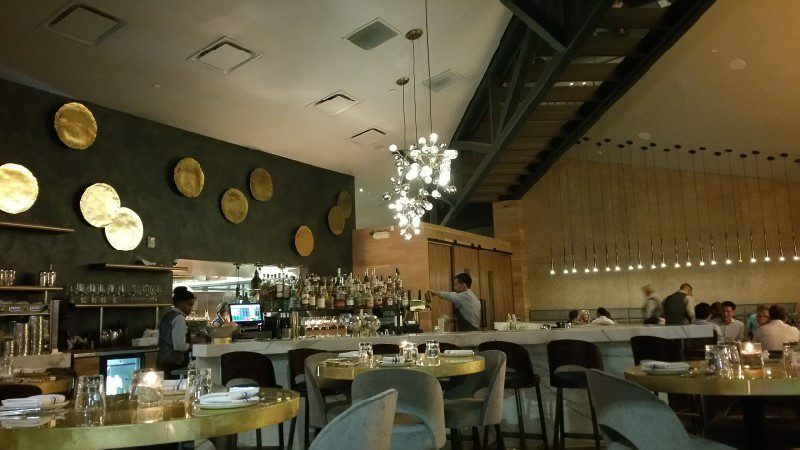 At Miro, three different experiences can be had. So I say, start your night with drinks in The Basement Bar, enjoy dinner in the restaurant and then head back downstairs for a nightcap in The Whiskey Room. This entry was posted in Cocktails, Food and tagged Chef Gavin Mills, Cocktails, downtown LA, DrinkWire, Liquor.com, Miro, Miro Restaurant, pan-Mediterranean, The Basement Bar, The Whiskey Room, whiskey, whiskey bar by Allison Levine.